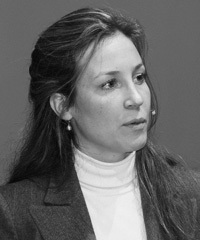 Leontien Plugge joined GRI in 2004 and has worked on several projects, including the Millennium Development Goals and the UN Global Compact principles. She coordinated the working group responsible for reporting principles in the development of GRI’s G3 Guidelines. Plugge also managed the small and medium-sized enterprises (SME) and supply chain reporting programs at GRI. She has been active in the field of sustainable development since her work for UNEP (Division of Technology, Industry, and Economics) in Paris in 2003 and 2004. Plugge has trained many SMEs in understanding, measuring, improving, and communicating sustainability performance, working primarily in India, Spain, and South America.